This project was to reconstruct the reinforced concrete eastern approach span of this twin tied steel arch bridge which carries the A525 over the Clwyd Estuary in Rhyl. 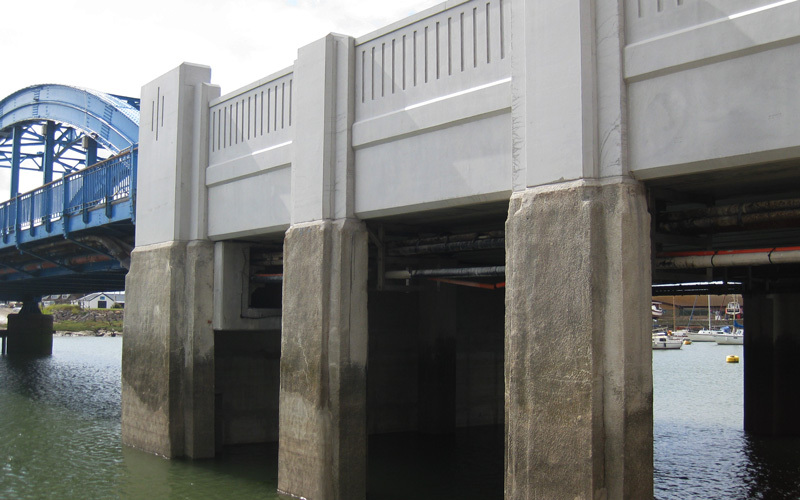 The works involved the construction of new foundations, abutments, deck and parapets. be used in the intertidal elements of the bridge. Although this option was more expensive than mild steel, it would have a much cheaper ‘whole life’ cost for the 120yr design life of the bridge. Other difficulties which this project presented were the services which were hung under the existing deck. These consisted of OpenReach fibre optic cables, a medium pressure gas main, two 11kV power cables and two water mains. As these services could not be diverted or isolated the bridge demolition and construction works had to take place with the services in-situ. This entailed temporarily supporting and encasing the service ducts to protect them during the works. As the structure was listed, YGC’s Structures Team liaised very closely with CADW and Denbighshire County Councils listed structures department prior to commencement of the design. This was essential to establish their requirements in terms of aesthetics and finishes. The bridge had to be reconstructed to look exactly like the original structure. This meant that the style of the ‘art deco’ parapets, deck and façade columns had to be accurately reproduced. As the A525 is a major artery connecting Rhyl with Kimnel Bay and the A55 to the West, disruption had to be kept to a minimum. In view of this the client requested that the works were limited to a 3 week bridge closure. As the closure period for the deck and parapet’s demolition/reconstruction was so short, it was decided that the new deck would be of pre-cast pre-tensioned beams and the parapet would also be of pre-cast units. In terms of programme this reduced the length of time required to construct the deck by omitting the lengthy curing times of this substantial concrete element. Also with regard to the pre-cast parapet, it meant that the units could be produced in a controlled indoor environment which ensured that the quality of the final product would be good without the influences of ‘on-site’ weather conditions and effects of a saline marine environment. 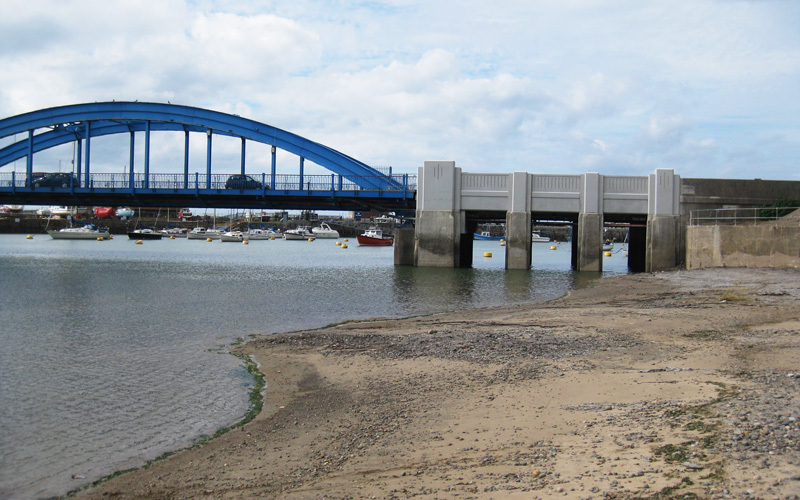 Due to its location within the tidal Clwyd estuary, the bridge required substantial temporary works in the form of a cofferdam to completely ‘dry- out’ the under bridge area. This then enabled the sub-structure and foundation works to take place between July and October without the interruptions of the tide or spate waters which are normally prevalent during that time of year. 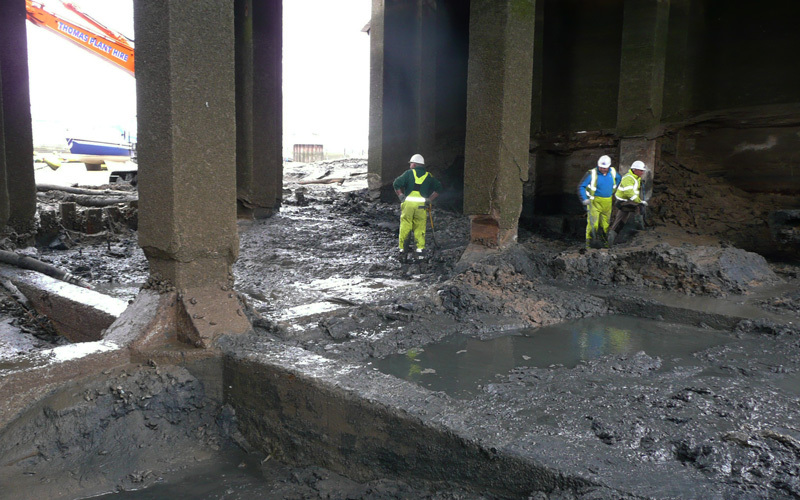 This measure also reduced the likelihood of weather and tides impacting the works programme, which helped to ensure that the project was delivered on time.